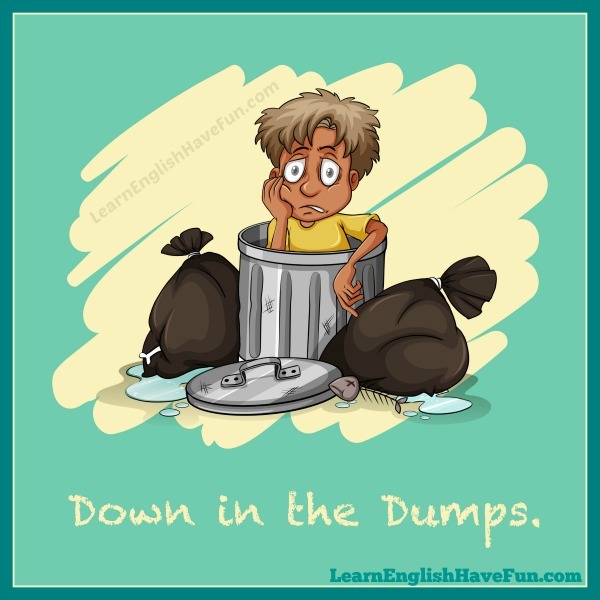 Can you guess the meaning of the idiom 'down in the dumps' by looking at the picture? Down in the dumps: sad, unhappy, discouraged and/or depressed. A dump is a large space of land where trash or garbage is disposed. If you were in a dump you probably wouldn't be very happy. Therefore, this idiom describes a person's sad, depressed and discouraged feelings. I've been down in the dumps since my cat died. Every winter I feel down in the dumps when it gets dark really early in the evening. She's been down in the dumps since her parents announced they are getting divorced. My diet was going so well until the holidays started. I feel so down in the dumps because I've already gained back ten of the pounds that I'd lost. When I lived in Geneva I felt down in the dumps a lot because it was often cloudy and rainy. Everyone felt down in the dumps after the long and bitter presidential election. After moving here I was really feeling down in the dumps until I met a few new friends at my gym. I bought my mother a big bouquet of flowers because I could see she was down in the dumps about something. My sister was down in the dumps for three months after her boyfriend was deployed to Iraq. We flew across the country for sunny weather but it's been raining the entire holiday and we all feel so down in the dumps we just want to go home. "Why are you down in the dumps?" "I failed my chemistry exam and my parents are going to kill me!" If you found this idiom useful, sign-up for my free newsletter to learn about new updates to my website. I also provide information about my writing contests and links to helpful resources. Writing your own example will help you practice your English and remember this idiom in the future. Write a sentence in the comments box below and I will provide feedback.